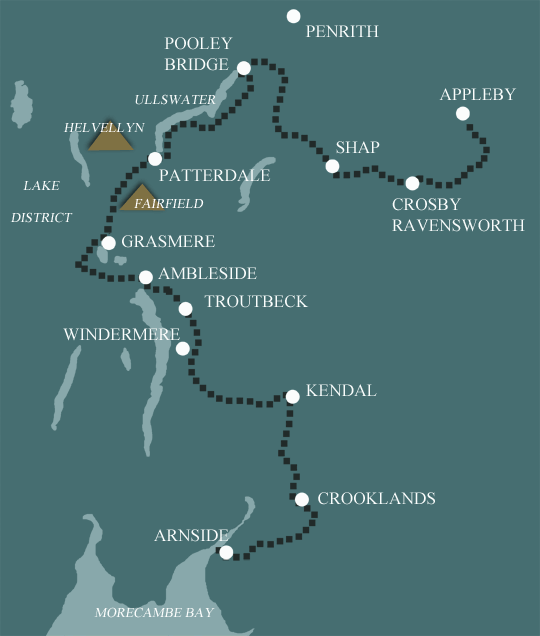 This is our middle length holiday covering the whole of the Westmorland Way route. It is perfectly achievable by fit walkers who are used to longer days and although it does involve a long day on the last day, it gives a good balance between duration and daily distances. The first day starts under the Pennines and ends on the fringe of Lakeland. Starting along the River Eden, the route leads through fields and quiet lanes linking Great Ormside and Great Asby, two lovely Eden Valley villages in between, the charms of Rutter Force are enjoyed. Carrying on over higher ground you will walk to Crosby Ravensworth, a secluded town. Shap is then reached by way of a stone circle and some typical limestone scenery. Although this is a fairly strenuous first day, the following days are considerably gentler. On leaving Shap you will walk past Keld Chapel and Shap Abbey before arriving at the river Lowther. Later, a climb up to the lovely village of Askham will provide you with some wonderful views. The route then drops down to a Norman church at Barton where you will meet the River Eamont. Follow the river to Pooley Bridge which is located at the end of Ullswater, England’s second largest lake. From Pooley Bridge the walk climbs gently on to the slopes of Barton Fell, where easy routes lead past an impressive stone circle before commencing a classic descent towards Howtown, with tremendous views down to the Lake. The route then takes in isolated and scattered communities of farmsteads and churches before heading to the lakeshore for a fine walk to Patterdale. The villages of Patterdale and Grasmere are split by a high mountain range, the longest high level range in Lakeland. The initial miles are through the side valley of Grisedale which penetrates deep into the folds of the Helvellyn range, before a climb to Grisedale Tarn. From here it is a short descent to Grasmere, directly below you, the home of William Wordsworth’s Dove Cottage. 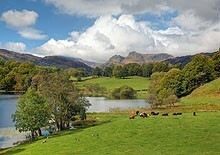 Between Grasmere and Troutbeck you will walk through central Lakeland and two popular valleys, finishing in a third. Three separate climbs will be encountered, all on easy paths and enjoying amazing views. From Elterwater in the beautiful Langdale valley, you will follow the river Brathay into bustling Ambleside. The final stretch encounters Jenkin Crag, which provides glorious views across Windermere (England’s largest lake) to the Langdale Pikes, before dropping down to this evening’s accommodation in Troutbeck. Troutbeck is famous for its beautiful 17th Century farmhouses with mullioned windows and tall cylindrical chimneys, so characteristic of Westmorland. From Troutbeck, field paths are largely used to approach the attractive fell of School Knot, a major local landmark, before charming undulating paths lead you to Underbarrow, in the Lyth Valley. A final climb up to Scout Scar with a picturesque walk along the edge is followed by a gradual descent into the medieval market town of Kendal, for your overnight accommodation. The final day is the longest, but with a generally easy terrain. On leaving Kendal the river Kent will accompany you for several miles, before being replaced with the Lancaster Canal and its towpath with undulating countryside and fine views. Woodland paths take over and after climbing the Fairy Steps you will head down to the Pele Tower at Hazelslack. The final climb is 500 feet to the crest of Arnside Knott which leads to fine views over Morecambe Bay, before descending to the end of the walk, on the Kent estuary in Arnside. Terrain: Rolling hills and moorland, Lakeland fells, then the lowlands of South Cumbria. What’s it like underfoot? Generally good tracks and paths, but some of the early sections not as well maintained as other routes. The section through the Lake District is a bit rougher, but good paths for the hills. How Much Up & Down? Rolling countryside for much of the route, with more ascent and descent in the central section through the Lakes. The biggest climb is 450m up to Grisedale tarn from Patterdale. Navigation: You will need to use your map and guidebook – no signposts and less well defined tracks in the early part, but well defined paths from Pooley Bridge onwards. You might encounter hill fog going over Grisedale – but the path is good. Maps 3 OS Explorer (1:25000) maps covering the whole route. By Air: The nearest international airports are Manchester (MAN) or Newcastle (NCL). You can then travel by train to Appleby (approx 3 hours from both). When traveling from Newcastle airport, take the Metro rail to the city centre railway station – the airport has its own Metro station (you will need some change for the ticket machine). The journey time from the airport to Newcastle Central Station is around 20 minutes. By Public Transport: Appleby has a railway station which connects with all major railway lines. By Road: Appleby in Westmorland is situated in the county of Cumbria. The M6 and A66 both pass in very close proximity. If you travel on the M6 to Penrith, Appleby is just 14 miles along the A66. By Public Transport: Arnside has a railway station for connections with the west coast rail line. By Road: From Arnside take the B5282 to the A6 and then join the M6.